Apple has repeatedly described the MacBook Air as the most popular Mac in its lineup, with years of neglect leaving some intimidatingly large shoes for the new 2018 upgrade to fill. After spending the last several days using it as our daily driver, we’re here with our review of Apple’s latest portable Mac. 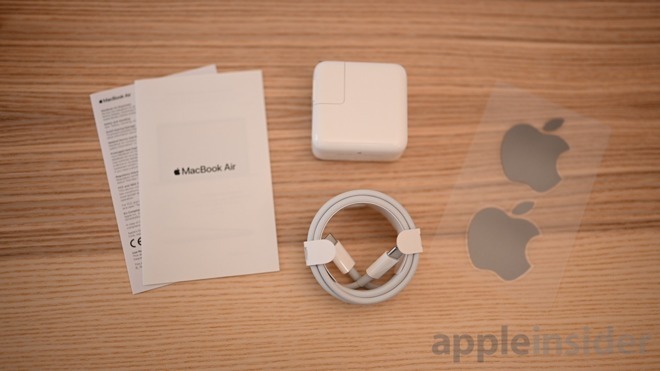 First, you have the new USB-C power cable as well as a 30W power brick. That is a tick up from the normal 29W USB-C power brick that Apple used to sell. We then have the usual smattering of getting started guides and the always-sought-after Apple stickers. Instead of the usual white matte stickers, we are treated to color matched stickers that go with the specific finish on the Air. We got Space Gray stickers with ours, while others will get gold ones with the gold and silver with the silver. The 13.3-inch display has a native resolution of 2,560-by-1,600 pixels, with scaled resolutions of 1680 x 1050, 1440 x 900, and 1024 x 640. With the Intel UHD Graphics 617, the new MacBook Air can support one external display with 5120 x 2880 resolution at up to 60Hz or to two external displays with 4096 x 2304 resolution at up to 60Hz over Thunderbolt 3. 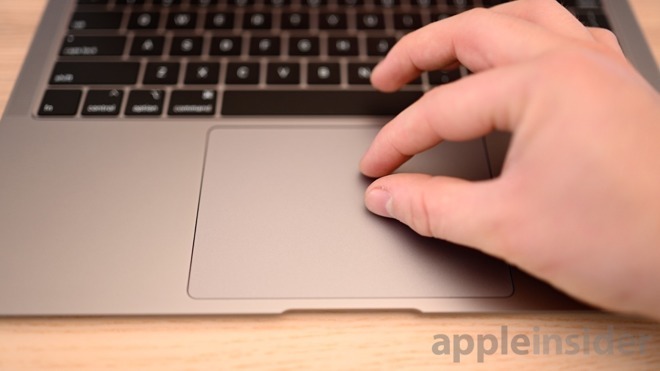 An updated third-generation Butterfly keyboard is above a 20-percent larger Force Touch trackpad. 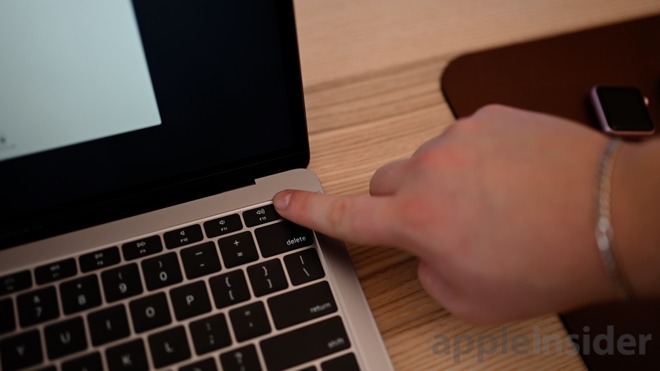 There’s no Touch Bar, but a Touch ID sensor does reside to the right of the physical function keys. 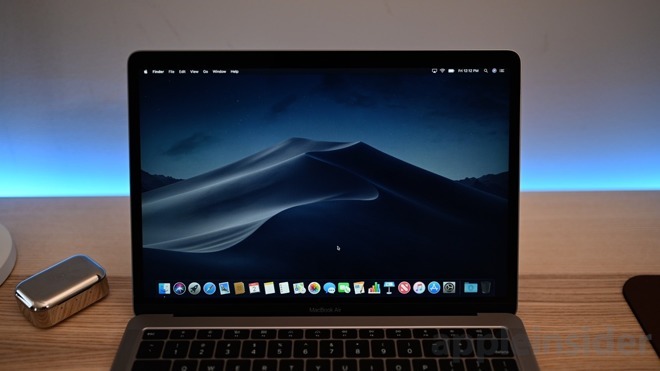 Despite adding these new features, the new MacBook Air still winds up with 17 percent less volume than the previous generation, weighing only 2.75 pounds. Our tested configuration has the eighth-generation Core i5-8210Y at a base frequency of 1.6GHz, with 128GB of storage, and 8GB of RAM. The new MacBook Air definitely got a big upgrade on the exterior hardware yet it still feels very familiar. It now looks very much in line with the rest of Apple’s lineup, between the 12-inch Retina MacBook and the MacBook Pros. The exterior still has a similar wedge-shaped design to previous model, though of course there are three different finishes now instead of just one. 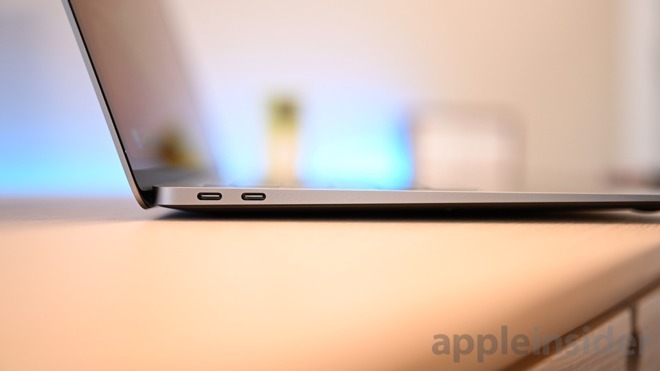 The headphone jack has survived with the Air retaining one even have it has been purged from the iPhone and iPad Pro. Rather than getting limited to a single USB-C port —such as on the MacBook —you now can connect multiple, more powerful accessories such as an external GPU with a pair of high-speed Thunderbolt 3 ports. When we compared the display of the new MacBook Air to our 15-inch 2017 MacBook Pro, they both looked pretty solid, but we noticed at least one difference —the new Air doesn’t get quite as bright. When we checked out the specs page, Apple outlines the newest Pros can reach up to 500 nits of brightness, while the new Airs only max out at 300. This would be more noticeable for anyone working outside, but isn’t a big deal in an office environment, or even a bright room. It is also worth noting that while the resolution is the same as the 13-inch MacBook Pro, it doesn’t contain True Tone, which we were a fan of in our review. The third-generation butterfly keyboard is the same as we saw on the latest MacBook Pros. That means it (somewhat) fixes the reliability issues and is quieter. That certainly seems to be the case here, with no noticeable difference in typing performance. As someone who types a a lot, I don’t mind Apple’s keyboard. In fact, I’d go as far as to say I actually like them. They are quick, responsive (when not sticking), and the 3rd gen one is noticeably quieter than my late-2016 MacBook Pro that sound loud in comparison. So much got upgraded here, but the one area that doesn’t seem to have seen much of a change is the speakers. They seem about as good as they ever were, which is to say about in the middle of the road. There is a big difference between them and the MacBook Pros, especially when it comes to the bass output. This is understandable with such a limited amount of space, but we weren’t blown away by the sound reproduction like we were with the 2018 MacBook Pro. Our findings line up with the preliminary benchmarks that had leaked online soon after the announcement. In our 1.6GHz machine, we averaged 4362 and 7858 on our single-core and multi-core tests respectively. Those are decent results for the low-power 7W Amber Lake Intel chipset, though not hugely elevated over the 2017 MacBook Air with the 1.8GHz Broadwell Intel chip which earned a single-core score of 3335 and a multi-core score of 6119. It also clocks in a bit above the Core m chip found inside the 2017 12-inch Retina MacBook. 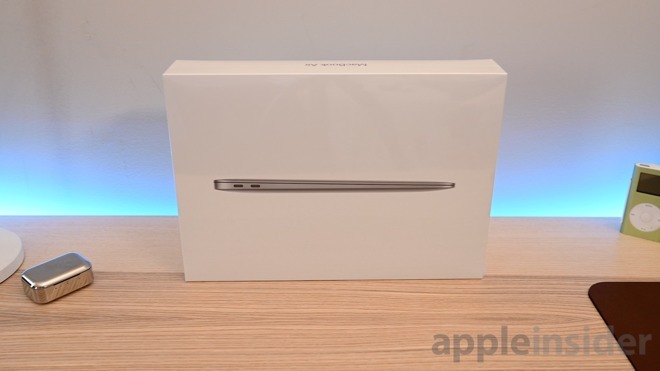 The 1.4GHz Retina MacBook earned 3925 and 7567 on their single and multi-core tests. Apple’s previous MacBook Airs used Intel chips with a 15W thermal design power, which ran much hotter than this year’s 7W. There was some warranted concern on how the new chip would perform, but it does appear to be showing some improvements. Apple did include a single fan to help that processor cool, and we’ll be looking at the effects of any thermal throttling on long-term processing jobs at a later date. Looking at Cinebench R15, we averaged around 30 fps on the OpenGL test and 229 on the CPU. This isn’t too surprising as we knew graphics were going to be a weak spot on the Air. In fact, as we went to run the test, we got the spinning pinwheel for several seconds as soon as we clicked the button to kick it off. Of course, these are just benchmarks, and not necessarily something that you can easily infer day-to-day performance from. MacBook Air has never been designed to be a powerhouse of a machine. It has always packed with just enough computing power to easily handle most real-world use cases its users will throw at it. 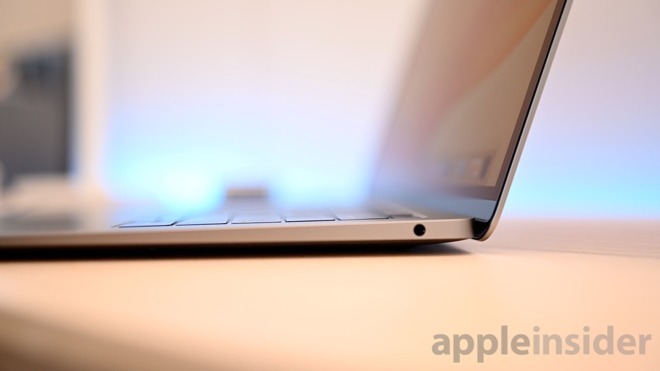 Other than graphics-heavy workloads, the MacBook Air will be just fine. We’ve spent several days now using it for all our common tasks from editing photos in Affinity Photo, taking notes in Bear, and editing some videos within Final Cut Pro. For the most part, as expected, all of these tasks were no issue for the new Air. Also as you might expect, there was some slowdown as the machine chewed on gigantic 44MP RAW images into Affinity Photo. But, smaller JPEGs or anything shot on our iPhones were processed easily, and without delay. When we took to FCP, we noticed that with actual editing of simple 4K video, there wasn’t much issue. Final Cut kept up with as we worked, adding a few effects, titles, and more. But, things changed when we went to export, and there is a huge difference between our 2016 MacBook Pro and the MacBook Air —but as long as you’re patient, it works fine. That is certainly great to see, and should people’s minds to ease if they are wondering if they can use FCPX on the Air at all. MacBook Air is an enticing machine. It fits squarely between the MacBook and the MacBook Pro, with tradeoffs of course. If you opted for the MacBook with a Retina screen instead, you’d be getting a much less powerful machine, no Touch ID, and a single USB-C rather than dual Thunderbolt 3. However, it is smaller and cheaper than the Air. On the other end of the scale, if you chose the MacBook Pro then that’s more expensive and heavier, but it comes packed with two more Thunderbolt 3 ports and better performance. Score: 4 out of 5. So close to greatness, but let down a bit by the lack of graphical oomph. Apple’s 2018 MacBook Air is available for preorder from Apple authorized reseller Adorama with no sales tax collected on orders shipped outside New York and New Jersey — plus no interest financing when paid in full within 12 months with the Adorama Credit Card. Since Adorama is an Apple authorized reseller, you can rest assured these are the same factory sealed systems you would find at the Apple Store. Orders are shipped on a first come, first served basis and your card will not be charged until your MacBook Air is ready to ship. For a full list of deals and product availability across multiple Apple authorized resellers, be sure to check out our 2018 MacBook Air Price Guide. *Adorama will not collect sales tax on orders shipped outside NY & NJ*. System qualifies for no interest when paid in full within 12 months with the Adorama Credit Card.